I’ll be honest: 2017 was garbage at best, even in racing. We even had a literal dumpster on fire in the parking lot of at one of the races I did. Yet shockingly, it wasn’t all bad. Bernie Ecclestone finally left F1, for example. Maybe we all forgot the good parts in our collective disgust at this year, but they happened. 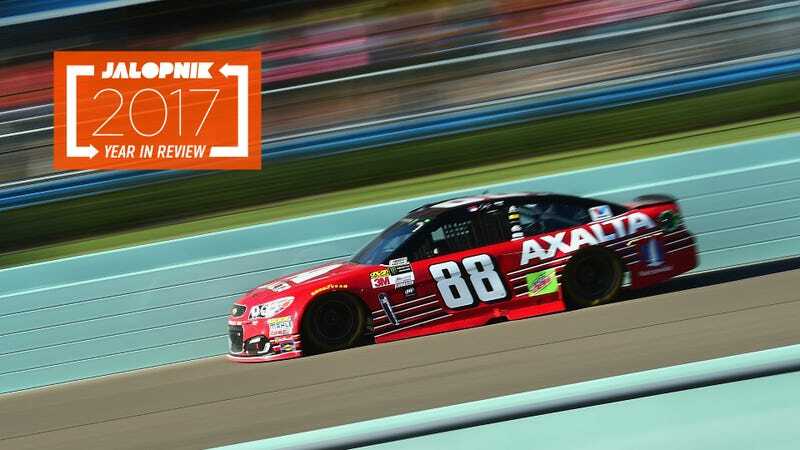 Let’s take a look back at 2017 in racing: the good, the bad, and the utterly confusing. Formula One’s sale to Liberty Media was finalized early this year, and they immediately started fixing some long-running problems. Bernie Ecclestone was soon moved to a “Chairman Emeritus” role in January by Formula One’s new owners. Ecclestone was responsible for turning F1 into an international powerhouse starting in the 1970s, but in recent years, he struggled to keep up with what modern fans wanted from the series. Given that Ecclestone doesn’t understand the Internet, doesn’t understand women and wouldn’t have even let Fernando Alonso run the Indianapolis 500, it was time for Bernie to leave. This was a year of incredible new machinery in IMSA’s Prototype class, with the likes of Cadillac, Nissan and Mazda using brand-tweaked versions of LMP2s against World Endurance Championship-spec LMP2s in the class. One of the best parts about 2017 was being able to poke around some of these incredible machines up close at Daytona. The Wayne Taylor Racing Cadillac was the fastest of the new class, sweeping all 36 Hours of Florida and ultimately winning the IMSA WeatherTech Sports Car Championship’s Prototype class for the year. Two series’ solutions to everything involved making their cars ludicrously quick this year. Formula One made their cars wider and faster, with more aerodynamic grip. They keep crushing track records, but it hasn’t really improved the racing all that much. If you like raw speed, though, good news! F1 cars are expected to be even faster next year. Likewise, the World Rally Championship’s 2017-spec cars channeled the legendary Group B cars, with big fender flares and wild aerodynamics. They don’t have to worry as much about passing each other, but they have had the odd problem of being too fast for some of the stage designs this year. New year, new confusing changes for NASCAR. This year brought us stage racing, which resulted in more thirsty moves at the ends of stages for position (and crashes when those moves don’t work out). The new overtime line rules were such a disaster that NASCAR changed them mid-season. Then there’s the repair rules. Can’t fix it on pit lane in five minutes? You’re out. This seems unnecessarily harsh for a series that’s most heavily associated with enormous wrecks. Finally, NASCAR admitted full stop that they’d like to be more like ball sports by renaming the Chase as the “Playoffs,” which are now a feature in all three of NASCAR’s national series. NASCAR’s favorite son Dale Earnhardt Jr. announced in April that he would retire from full-time Cup Series racing at the end of the 2017 season. Earnhardt pointed to his long concussion recovery as one of the major reasons for his retirement, reiterating that he’d like to retire while he’s still sharp. As the son of NASCAR legend Dale Earnhardt Sr., Dale Jr. is beloved by nearly everyone, having won the series’ Most Popular Driver title for fifteen years in a row. He truly felt like one of us, with his yard full of crashed race cars and a tendency to speak his mind openly to the masses. More importantly, he’s been using that popularity lately to speak out on behalf of better concussion care for drivers. His final season wasn’t his best, finishing 21st in the Cup Series for the year. But don’t fret—he’ll drive occasional races with his JR Motorsports Xfinity Series team, appear on a DIY Network show with his wife and join NBC Sports’ NASCAR commentary team. Two-time Formula One world champion Fernando Alonso is a true hero of Jalop-ness this year. Alonso isn’t just wistfully blathering about how winning the Triple Crown of Motorsport would be cool—he’s out there getting the seat time to make that happen. This year, he skipped driving his unreliable Honda-powered F1 car at Monaco to run the Indianapolis 500. While he was quick almost immediately in the car, leading at points during the Indianapolis 500, the Honda curse struck again. 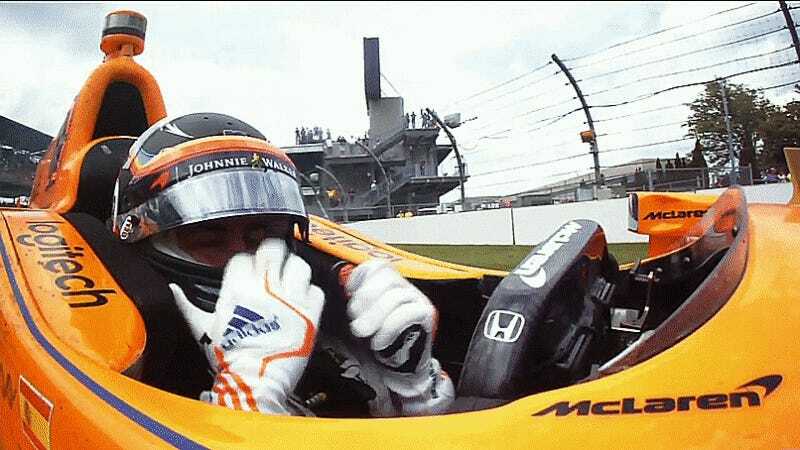 Alonso retired before the end of the Indy 500 in a cloud of smoke. Don’t be too sad: he’ll come back for another try. We hope Alonso’s trend of F1 crossovers continues. Both Alonso and Williams F1 driver Lance Stroll are set to compete at this year’s 24 Hours of Daytona, and Alonso even tested out the Toyota LMP1 car after this year’s WEC season was over. See you at Le Mans—I hope. Two words can sum up the top LMP1 class at the 24 Hours of Le Mans: everyone broke. The LMP1 cars were so unreliable this year that the top-class, ultra-fast, ultra-advanced No. 2 Porsche 919 didn’t regain the lead from a slower LMP2 car until the final moments of the race. LMP2s finished second and third overall, as this was the first year since 1995 that multiple classes shared the Le Mans podium with each other. LMP2 wasn’t immune from drama, as the third-place overall finisher in the race was disqualified for drilling a hole in their bodywork so they could tap their starter with a hammer. Fortunately, the GT classes provided us with an epic Aston Martin vs. Corvette battle at the very end, as they all too often do. Even the race’s live stream was borked this year, as a massive ransomware attack brought the stream to a halt several times during the race. Team Joest was the crew who helped Audi dominate the top class at the 24 Hours of Le Mans for so many years and finally, they’re back in a prototype. They’re heading to Daytona instead of Le Mans next year, working with Mazda’s long-suffering IMSA prototype effort in the WeatherTech Sports Car Championship. Between this and Acura’s new factory Prototype effort coming next year, the WTSC’s top class appears to be thriving. Somehow, our continent’s wacky regional endurance championship is enough right now to lure big international names like Joest over, say, whatever’s going on with the WEC’s top LMP1 class. Porsche dropped its 919 WEC program to go into Formula E instead, leaving the WEC with Toyota as their only manufacturer left in the top LMP1 class. This set off big changes as the WEC fights to maintain its relevance. Next season will have a reworked LMP1 class where privateer non-hybrid LMP1 teams will compete directly against Toyota for a season-long LMP1 teams’ championship. It all transitions into a reworked WEC calendar with seasons that end with the 24 Hours of Le Mans in June—not at the end of the calendar year. Maybe it’s good that the team who was constantly outspent by Porsche and Audi is the lone one left and helping to guide policy on what’s next. The price of simply participating in LMP1 has been unsustainable for many marques to even consider. Porsche isn’t completely out of the WEC, though. They’re entering four LM GTE Pro-class 911 RSRs at Le Mans next year. I mean, that four-car GT assault schtick worked out well for the Ford GT’s debut year, so why not? McLaren finally rid themselves of their failed F1 engine partnership with Honda this year after years of suffering, keeping Fernando Alonso around thanks to a switch to hopefully more reliable Renault power. The one likely loser might just be Toro Rosso, who agreed to take over Honda as their engine supplier next season. Worse yet, they loaned perhaps their most promising driver—Carlos Sainz Jr.—to Renault to smooth over getting let out of their current engine supply deal. Bonus suckage: F1 now wants each engine to last even longer. If Honda’s engines aren’t better next year, the series’ stupid, confusing grid penalties will kick in even sooner. 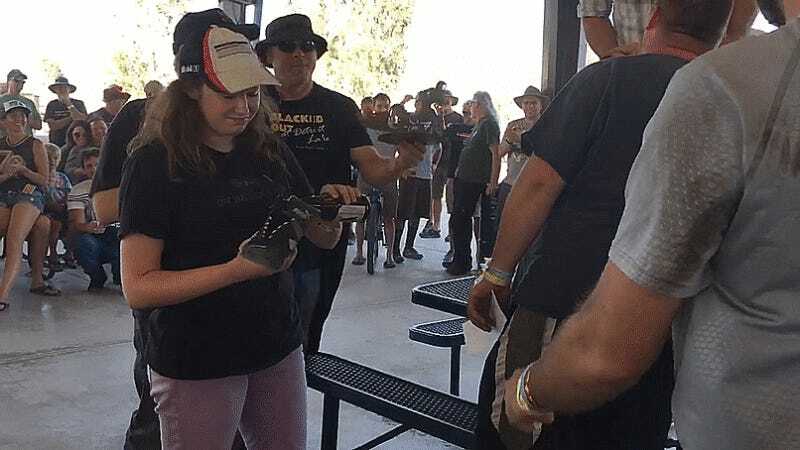 I, a perpetual failure machine in human form, won the 24 Hours of Lemons’ biggest prize: the Index of Effluency. I tasted victory, which tasted like an IPA drunk from a shoe. It was glorious. Clearly, our team’s Volkswagen 411 didn’t win a race on laps. Rather, we did the best out of the truly hopeless causes that showed up. That’s what Index of Effluency is for: making a thoroughly un-trackworthy car race better than it should. I now own this Volkswagen 411, and there’s still a lot of things wrong with it, even after I sourced more of the cooling parts, replaced the pistons and cylinders, and tried to race it again. Let us not speak of the “I Got Screwed” trophy I got for that attempt. It won the other time, and that’s incontrovertible proof that the 411 is awesome. Level 5 Motorsports was one of the most insane stories in motorsport, with a seemingly unending bank account to fund whatever team owner Scott Tucker dreamt of doing. One of the team’s earliest cars was a club racing car that beat the lap times of a contemporary LMP2 car, for Pete’s sake. Yet that team’s bottomless pocketbook was funded by a host of illegal payday lending practices, which landed Level 5 team owner and former American Le Mans Series champion Scott Tucker in trouble with the feds. This October, Tucker was convicted of the racketeering charges lobbied against him, capping off several years of lawsuits and disputes with the Federal Trade Commission. Protip: maybe don’t fund your race team through the predatory loan biz. So far, Formula One’s new owners at Liberty Media seem all right despite the weird new series logo, like they live in the actual present of 2017 or something. They loosened their social media policy to let drivers and teams share more behind-the-scenes stuff with fans and started throwing old races and other good clips up on YouTube. Then they went one further: they announced that they’ll be finally giving us an online F1 live stream. That being said, it sounds like our TV broadcast may suffer a bit as a result. F1 didn’t renew its agreement with NBC Sports, likely due to the fact that NBC’s owner Comcast saw Formula One’s new direct stream as competing with their own broadcast services. ESPN got the F1 broadcasting rights as a result, and early reports indicate that they’ll be putting minimal effort into it, without the local broadcast team U.S. fans are used to. We’ll see how it ultimately works out next year. At least we got to see the NBC broadcast team do one last shoey before their final sign-off. Two Xfinity Series standouts moved up to the Monster Energy NASCAR Cup Series this year, breaking some new ground for NASCAR in the process. Mexican NASCAR driver Daniel Suárez has an ever-growing list of “firsts” to his name as the first Mexican driver to win a NASCAR national series race and the first foreign-born driver to win a NASCAR national series title with the Xfinity Series. This year, he became the first full-time Mexican driver in NASCAR’s top Cup Series. In October, Richard Petty Motorsports announced that Darrell Wallace Jr. will drive full-time in their No. 43 car next year, becoming the first black driver to do so since 1971. Wallace is only the fourth black driver ever to compete at NASCAR’s top level. Formula E keeps growing thanks to ever-increasing manufacturer involvement, even if no one’s sure if fans will follow them there yet. Manufacturers have to develop electric cars for the road, and Formula E is the top series to do that in. Nissan, Mercedes, BMW, Porsche and Audi announced recently that they’ll have works teams in the series soon, which is pretty incredible for a series that’s only three years old. We might not be able to hear the cars and we’re not sure we’re excited about marques picking Formula E over the likes of DTM or LMP1, but at least the racing is close and the cars are a joy. The Formula E race car is hilarious fun to drive, and by far the best thing I’ve driven all year. We thought we might have a good Mercedes vs. Ferrari battle going this year between Lewis Hamilton and Sebastian Vettel. However, Ferrari seemed to fall apart after losing the championship lead at Monza, which allowed Lewis Hamilton to wrap up a fourth F1 title. Ultra-dominant Mercedes also took home another constructors’ championship in the V6 turbo hybrid engine era, the sky is blue, and water is wet. No woman has won the NHRA’s Top Fuel class since Shirley Muldowney got her third Top Fuel championship in 1982, but that’s just what Brittany Force did this year. Brittany races for her father’s team, John Force Racing, which also won the teams’ championship this year. It’s impossible to watch John’s reaction to Brittany’s title win and not tear up just a bit. This year was the fiftieth anniversary running of the Baja 1000, one of the world’s most legendary off-road races. It attracts everything from relatively stock Class 11 Beetles to giganto-budget trophy trucks, and the 50th running attracted a massive field of over 410 vehicles. Jalopnik had not one, but two staff members racing in it. Jason drove a stint in a Wide Open Buggy, and Andrew Collins would have done some co-driving in a BajaLite truck if it hadn’t blown a transmission pump seal halfway through the race. Jason also got to check out a Class 11 Beetle that was prepared for the race—a car which I have not wanted, but needed, ever since the first Dust to Glory film made everyone want a Class 11. All of this Baja talk isn’t helping that. Danica Patrick’s last race as a full-time NASCAR driver was at the Homestead-Miami Cup Series season ender, where her race was cut short after contact caused her car to go up in flames. It was an anticlimactic end to an era, as Patrick has been one of the most well-known women in racing for years. While she wasn’t the most successful driver overall, she became the most successful woman to compete in American open-wheel racing early in her career. More importantly, she proved to a generation of women that there is a place for us in racing, and it’s okay to be into it. After scowling through pre-playoffs photo ops when his last regular-season race ended poorly, Martin Truex Jr. won the Monster Energy NASCAR Cup. It’s been a fun comeback for a guy who was almost left without a ride when his then-team Michael Waltrip Racing was scaling back and leaving him without a car at the end of the 2014 season. Fortunately, Furniture Row Racing picked up Truex for the 2015 season, and this year, it all came together. When everything else looks bleak, all you have to do is think about how plucky World Rally Championship underdogs M-Sport’s year ended up. Then-four-time WRC champ Sébastien Ogier was left without a ride late last year after Volkswagen shuttered their WRC effort. The one place that had room for Ogier was M-Sport, the lone non-manufacturer team in the WRC. While all the other teams have the full backing of a marque like Citroën or Hyundai behind them, M-Sport doesn’t, and has to make do with less. M-Sport’s Fiesta turned out to be more reliable than some of the big-budget works efforts, leading M-Sport, Sébastien Ogier and his codriver Julien Ingrassia to win the WRC teams’ championship, drivers’ championship and codrivers’ championship, respectively. Yet no one was sure what would happen to the team after this year. M-Sport didn’t have the funding to keep driver Ott Tänak from moving to Toyota for 2018, and Ogier was considering retirement if he couldn’t remain competitive. Shortly after the season concluded, M-Sport finally got some of the extra support from Ford they deserved after years of being surprisingly good without it, and we as fans finally got to see an underdog team story that didn’t end with horror or disappointment.